Looking for Art Deco miniature furniture? This is a cute set. Original doll play house miniature dining room suite including table, 4 chairs, china cupboard, tray with two bowls for table, sofa and mirror buffet. 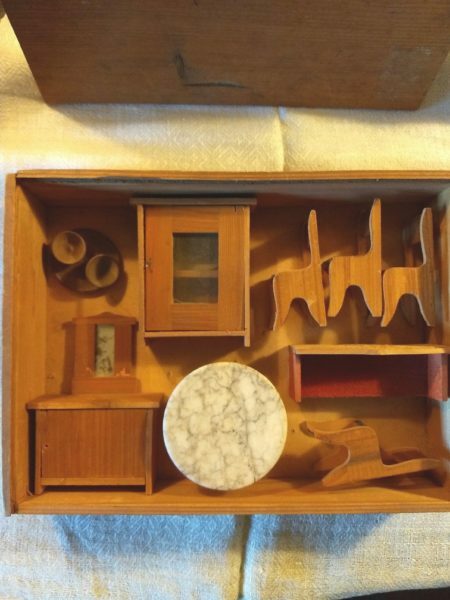 The wooden furniture in still in the original wood box with French label. The seat of the four chairs, as well as the seat and back of the sofa has a red fabric covering. Cut and glued, simply done.